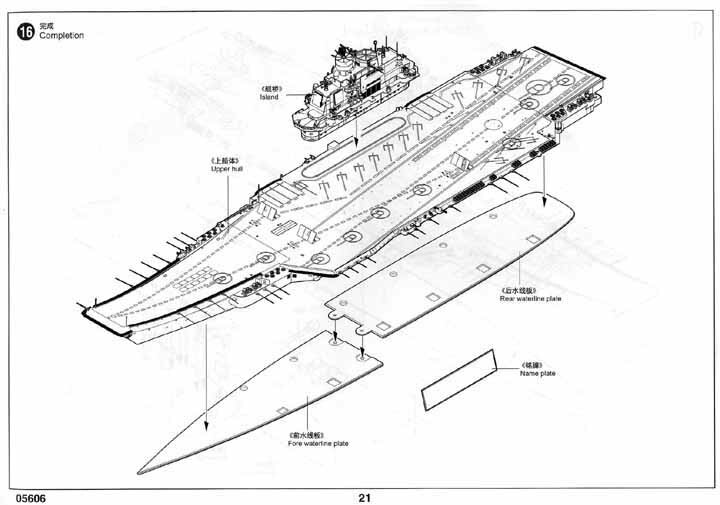 The 67,500 ton Admiral Kuznetsov was the Soviet Unions first full flight deck carrier, also known as Project 1143.5. 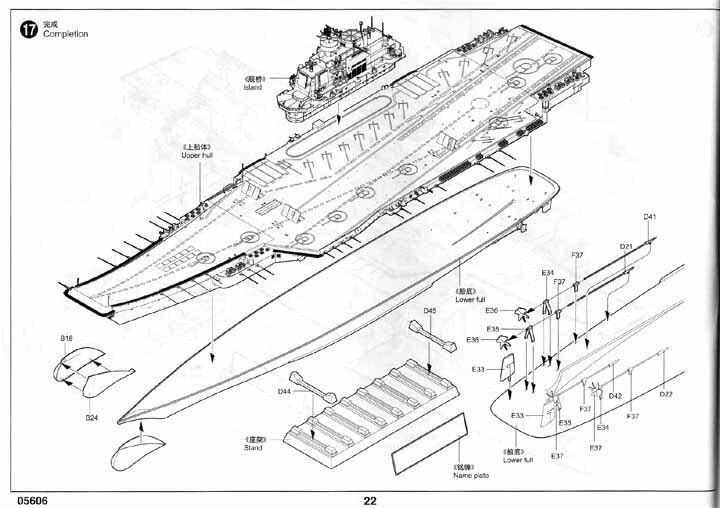 It would probably be better classified as an Aircraft Carrying Cruiser as it relies more on it's offensive missiles than aircraft. 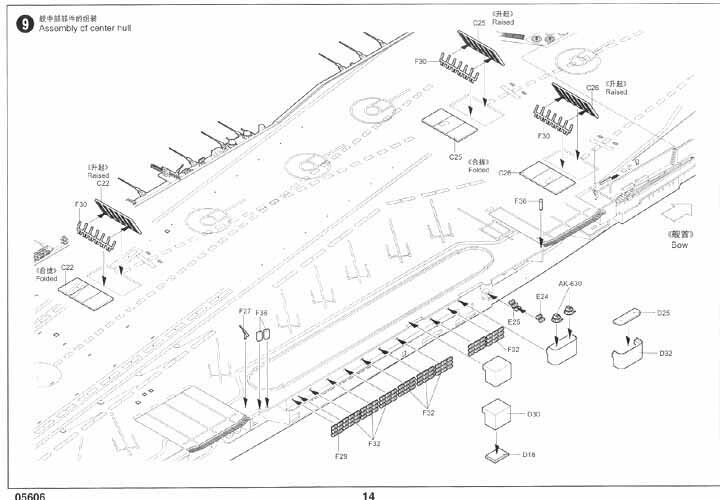 The ship features a ski jump style flight deck to help get the aircraft airborne as no catapults are used. 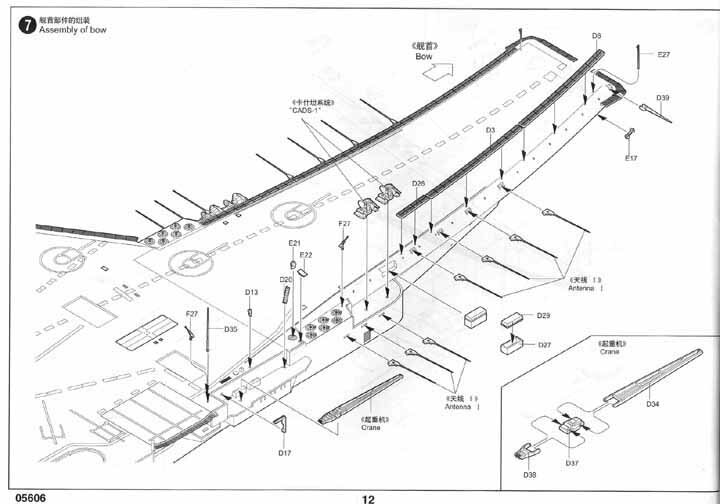 A traditional angled deck allows for simultaneous launching and recovering of aircraft. 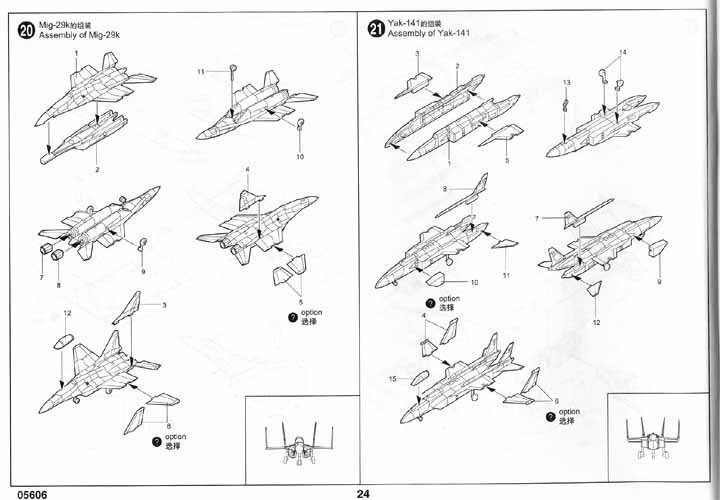 The aircraft she was designed to operate include navalized versions of the Su-27, Mig-29, and the proven Yak-41M VTOL, and Ka-27 Kamov Helicopters. 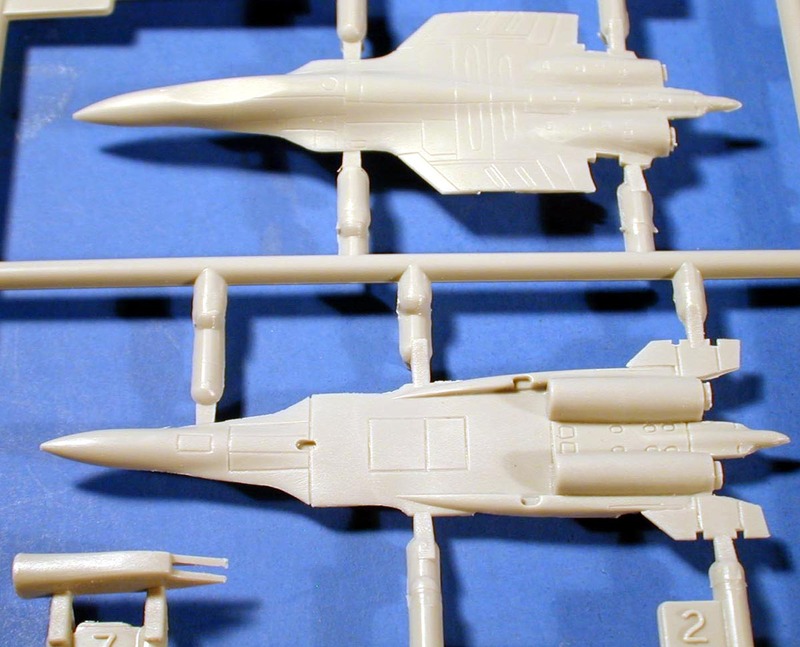 They were designed to operate in the Air Superiority role in defense of SSBN forces. 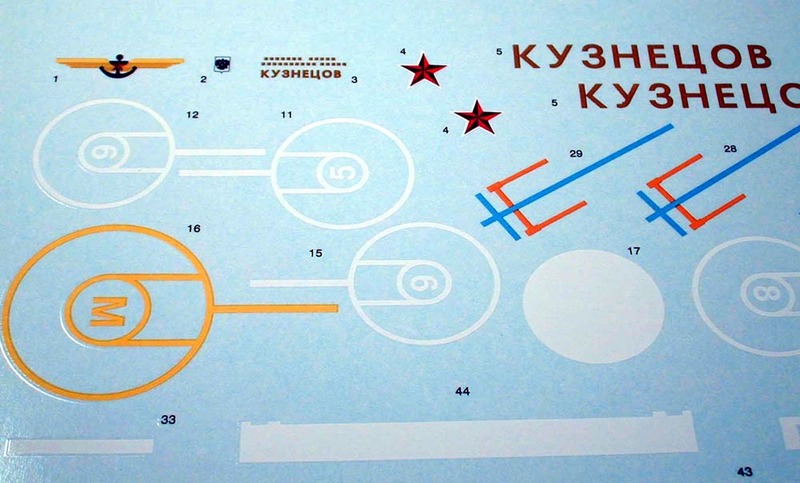 The Kusnetsov is the only ship of this type to see service. 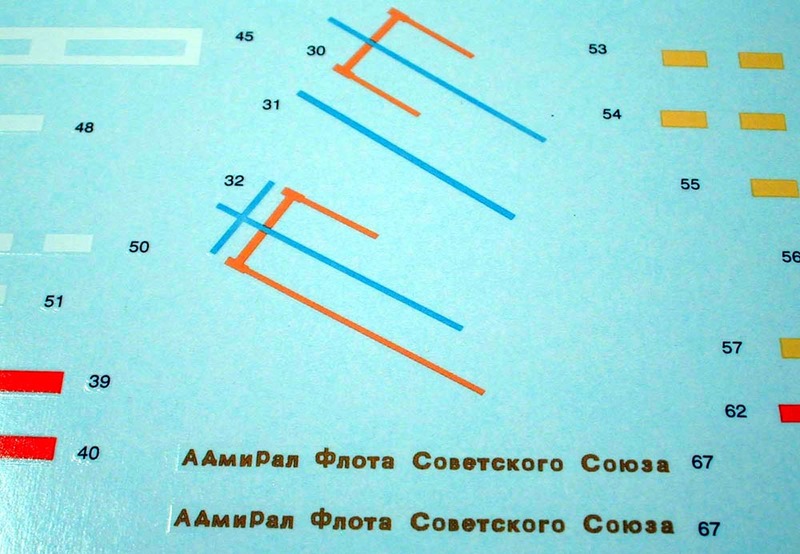 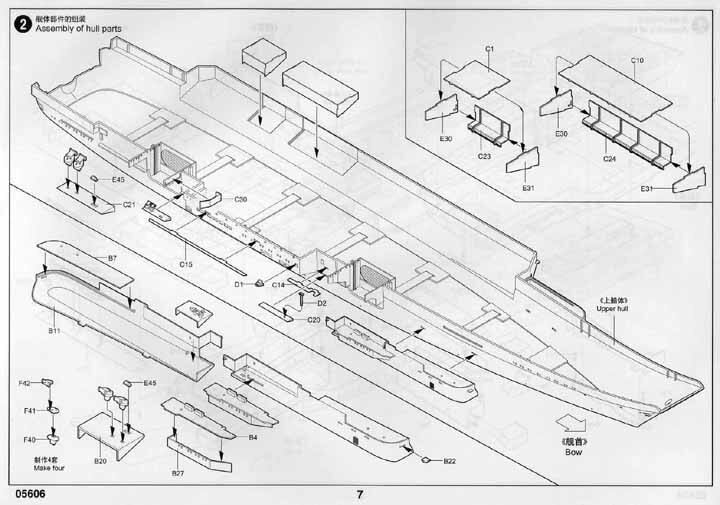 A second ship, the Varyag was canceled and never completed due to changing strategic needs. 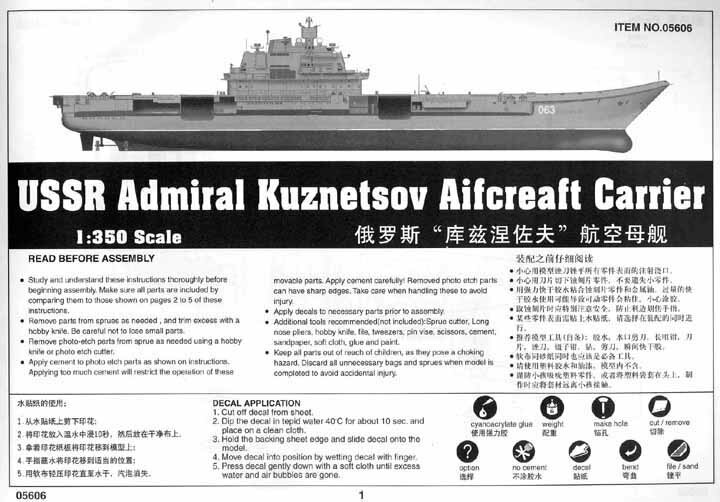 The Kuznetsov also carries the SS-N-19 Anti Ship missiles in twelve launchers. 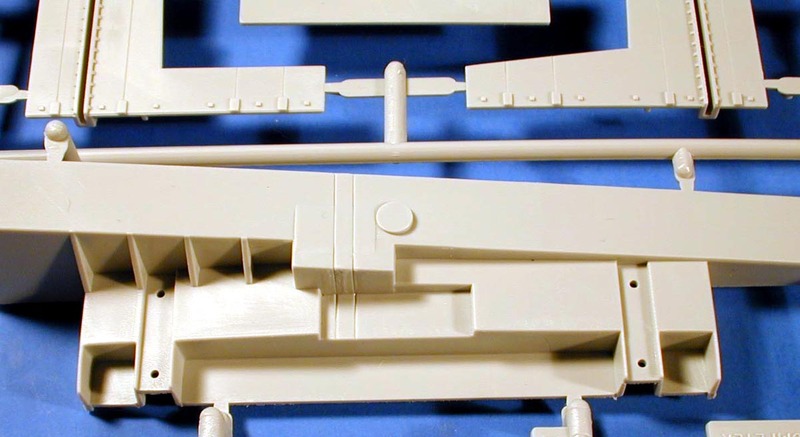 Like other Soviet era ships, she bristles with all the latest in air defense weapons and radar. 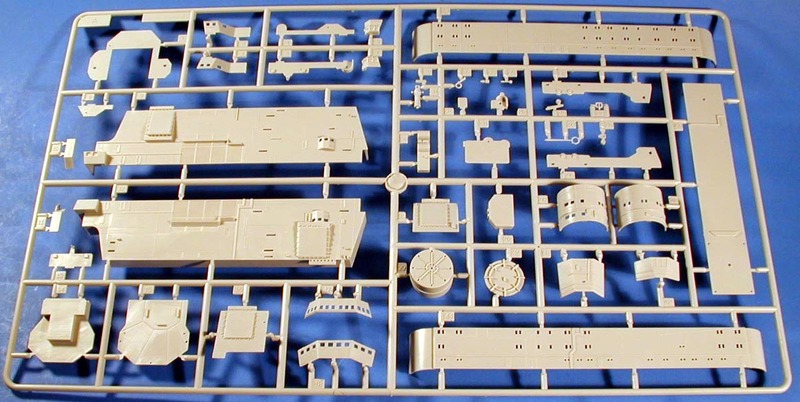 Like the real ships this new kit from Trumpeter is huge. 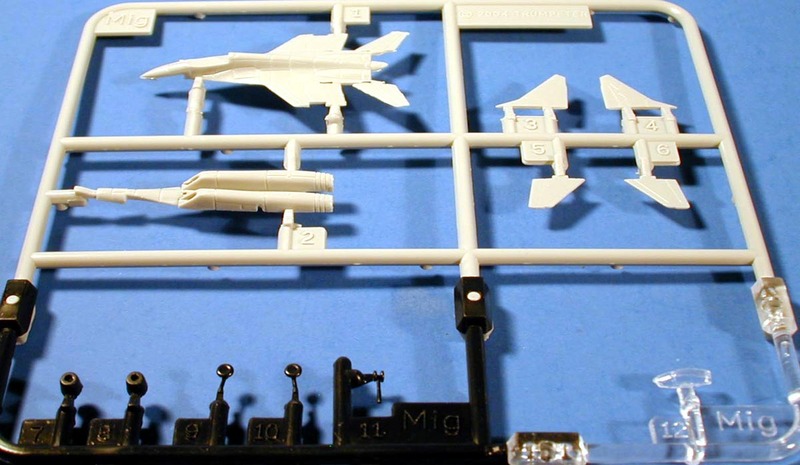 The kit comes well packed in a large box with cardboard divides securing things in place. 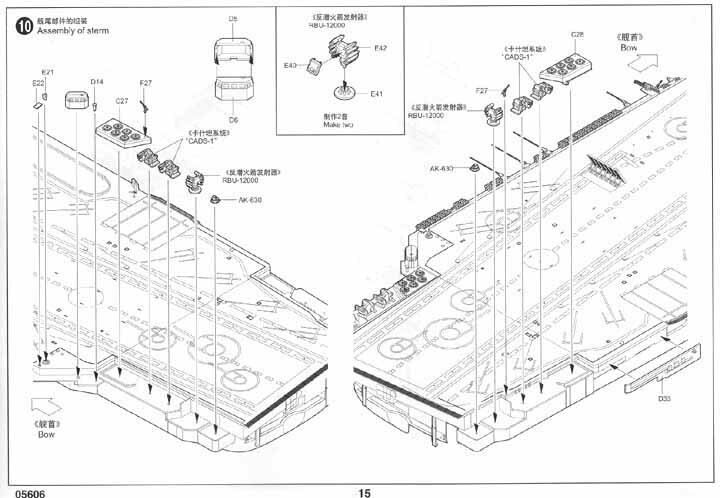 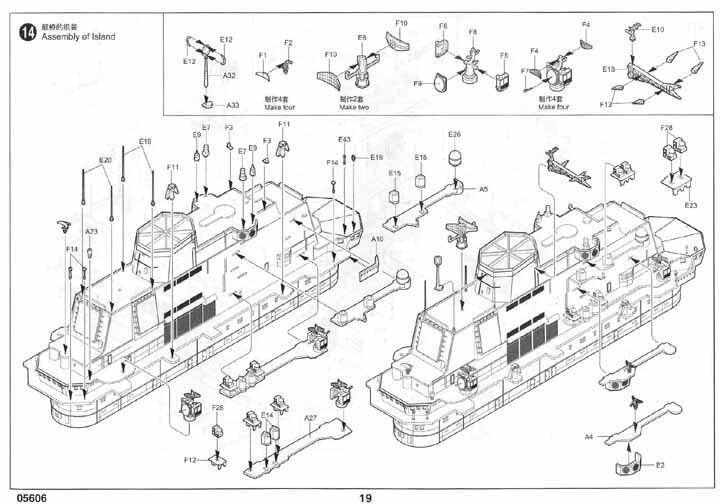 The flight deck comes in three parts. 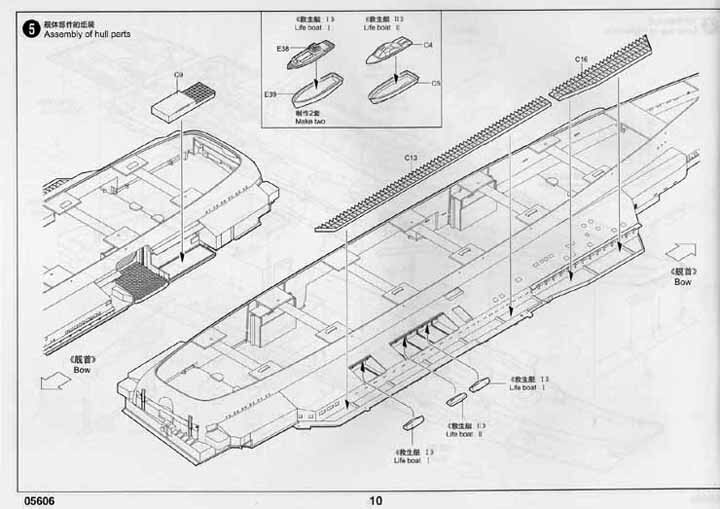 The bow with it's distinct ski jump and rounded sides joins to the main deck with a read deck add-on. 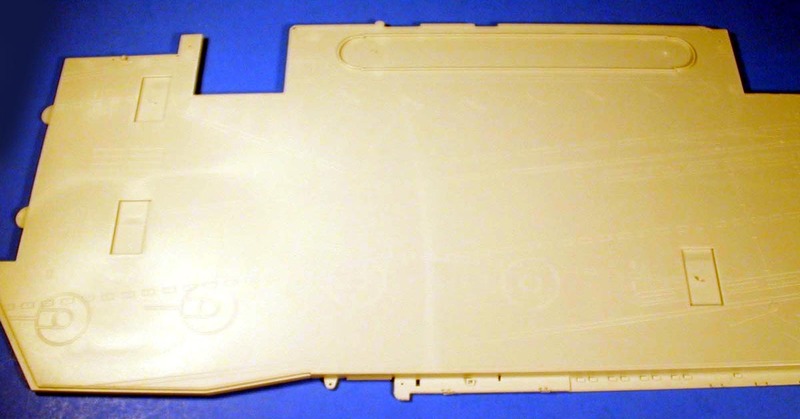 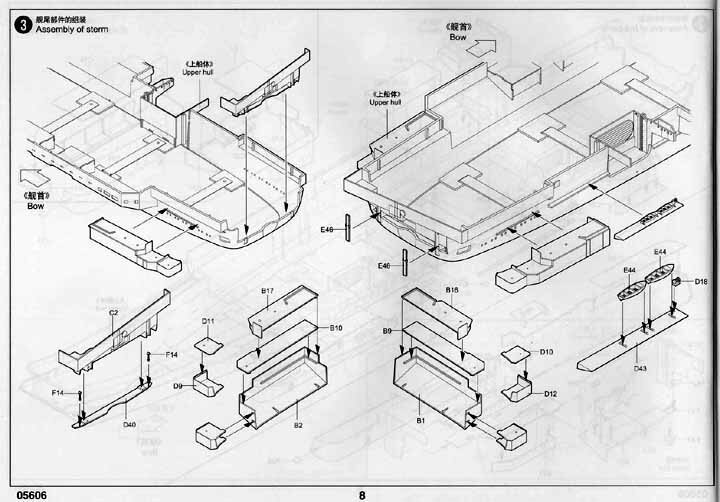 All the parts have little tabs to help keep the decks level when joined. 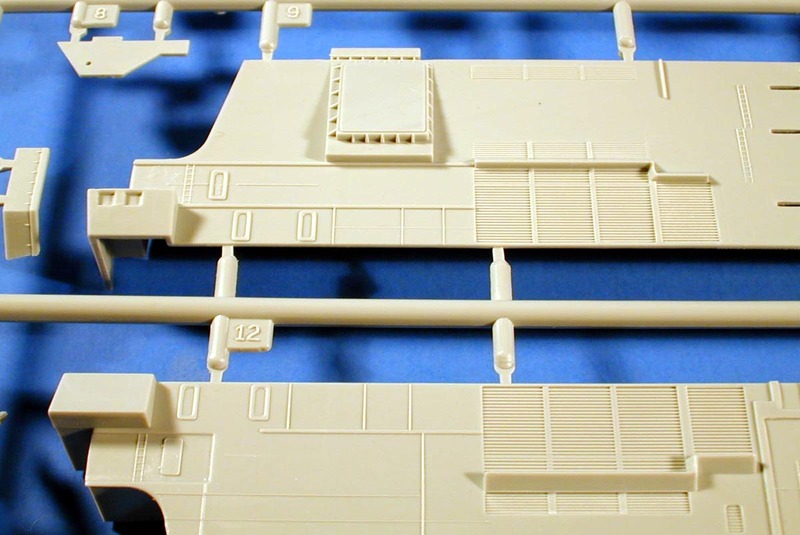 The flight deck lines are etched into the surface. 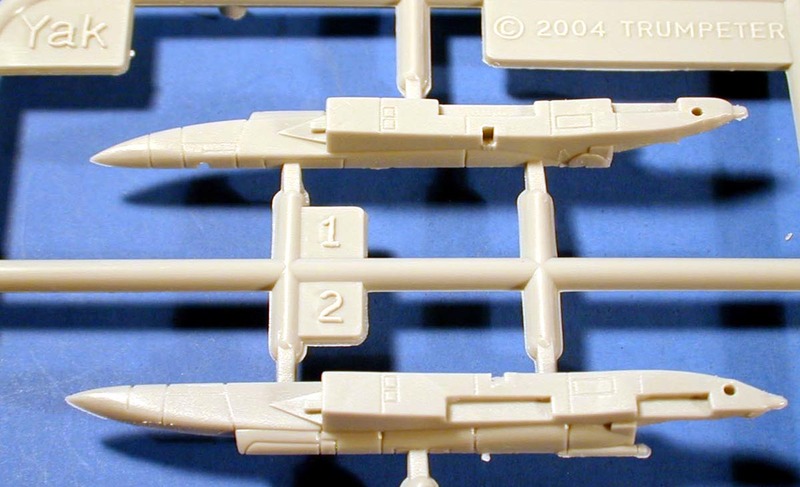 I would prefer to use the decals to represent these lines instead of them being molded on. 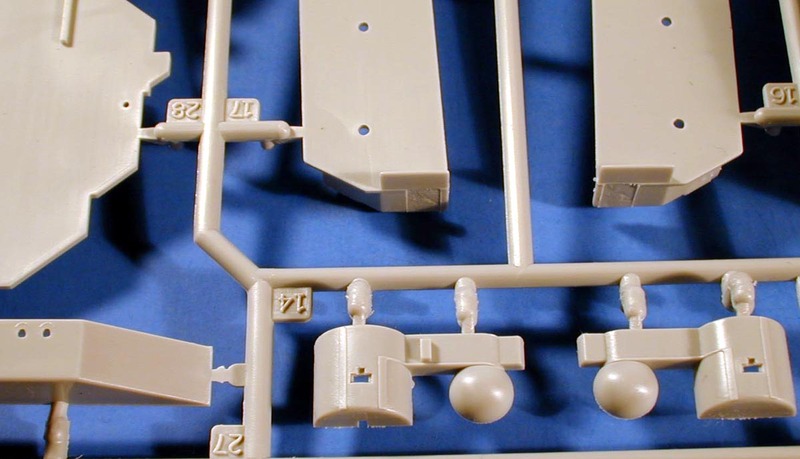 The detailing on these superstructure parts is very nice. 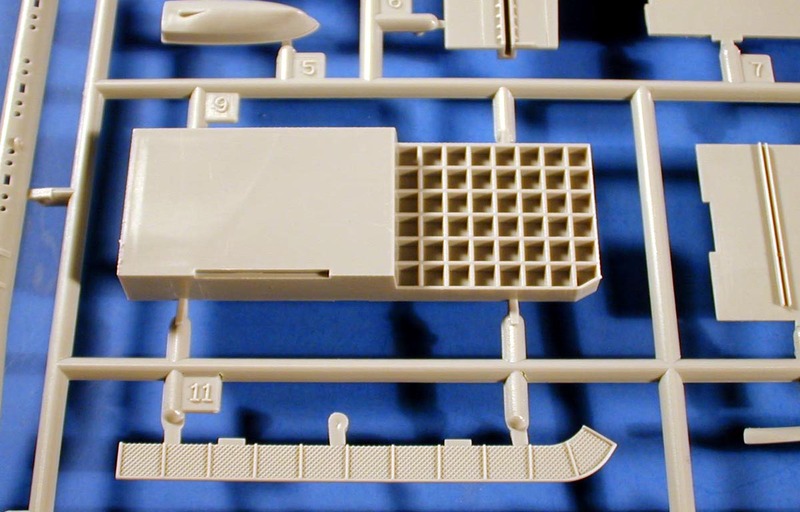 Some of the windows are molded open as are many of the portholes. 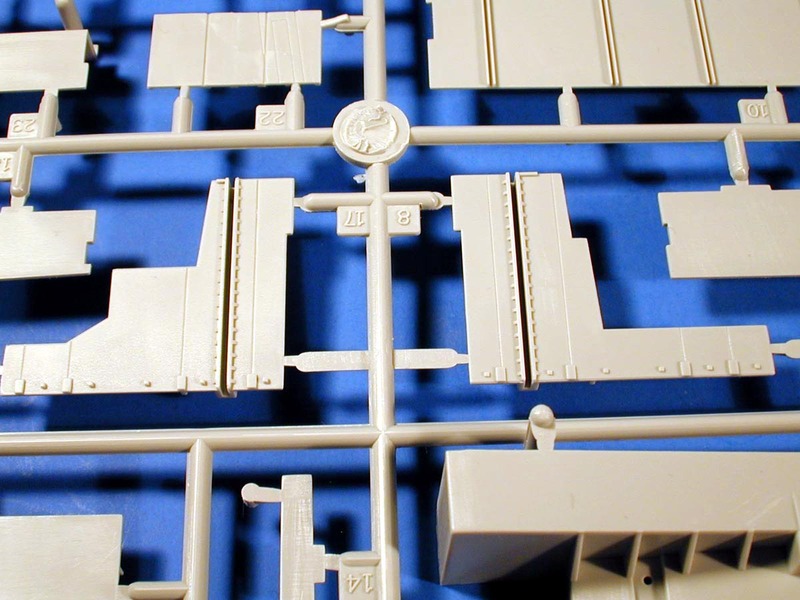 Exterior conduit and vents and grills are molded with some very intricate details. 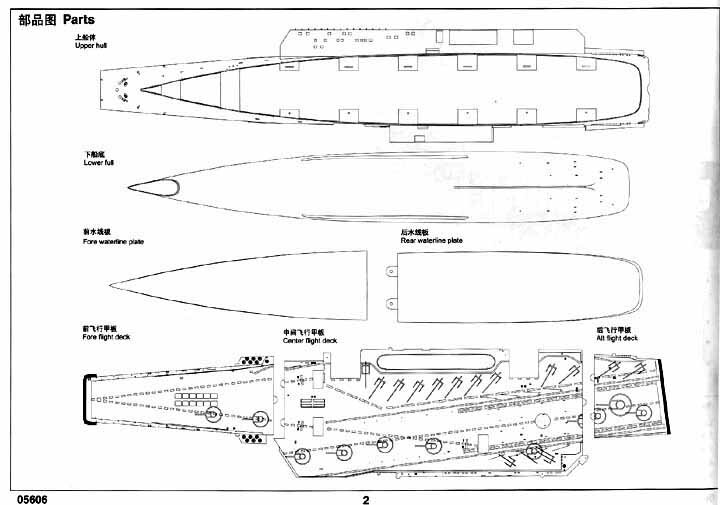 Includes the bulbous bow halves and many of the major structural parts. 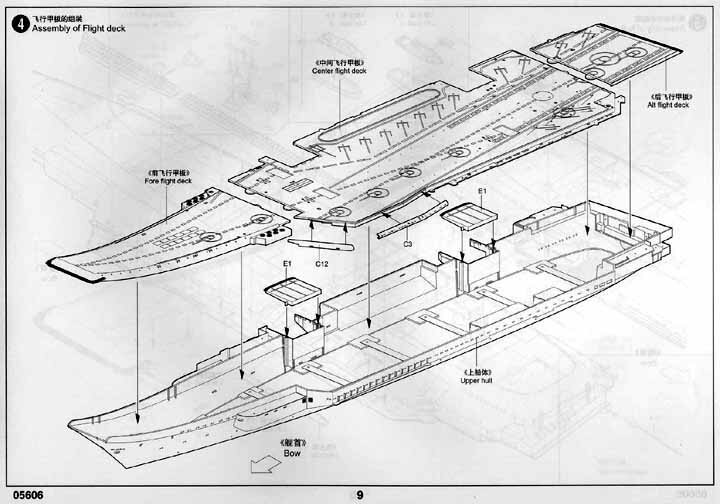 Notice the channels for the deck elevators. 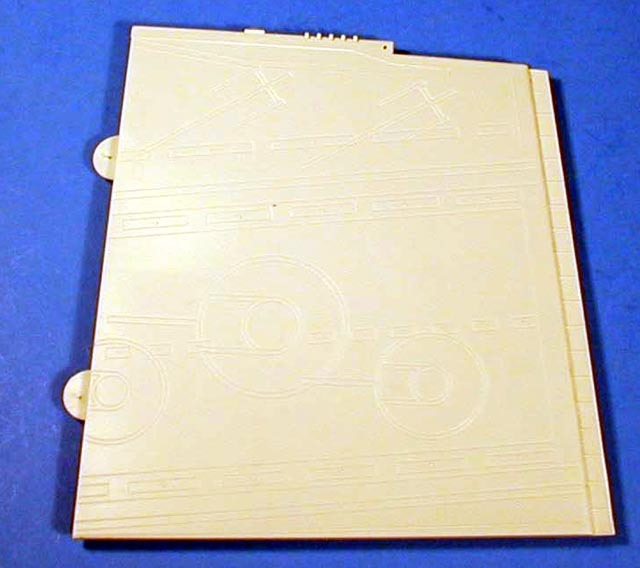 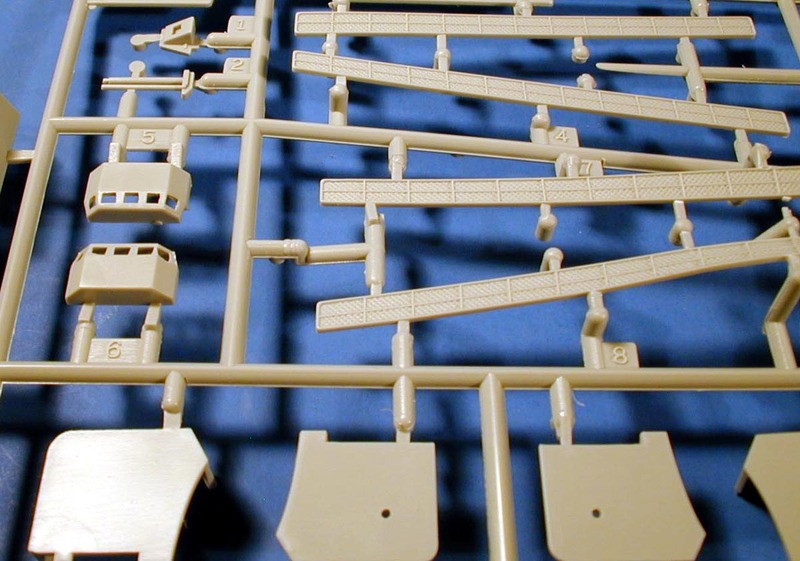 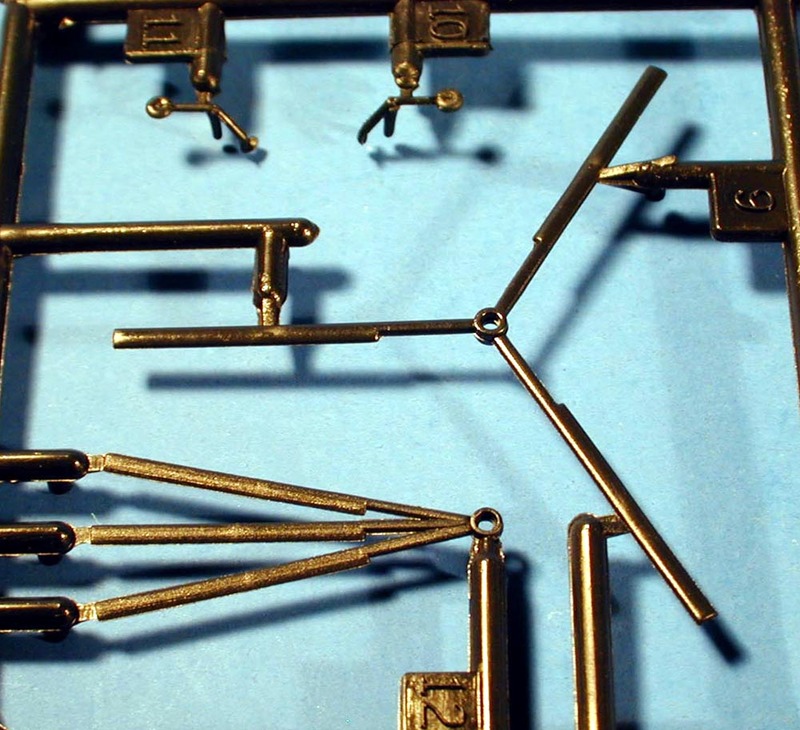 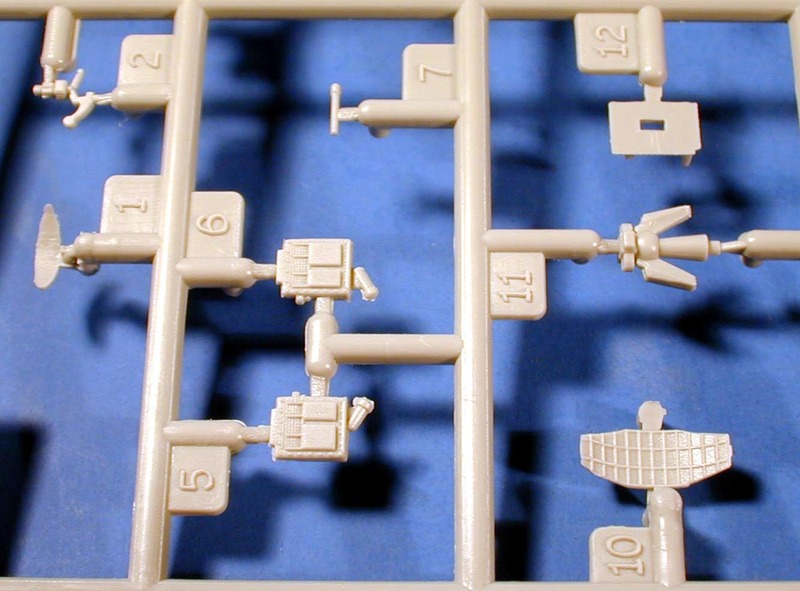 There are two of these sprues with deck elevators and a number of really fine parts. 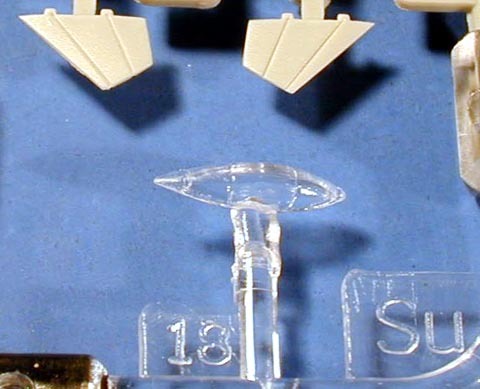 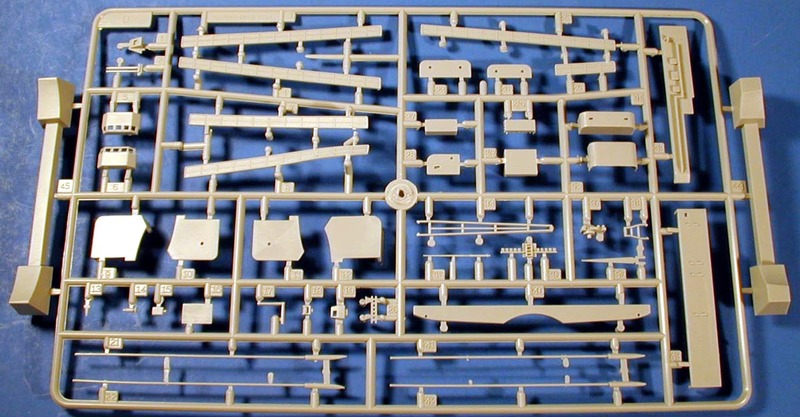 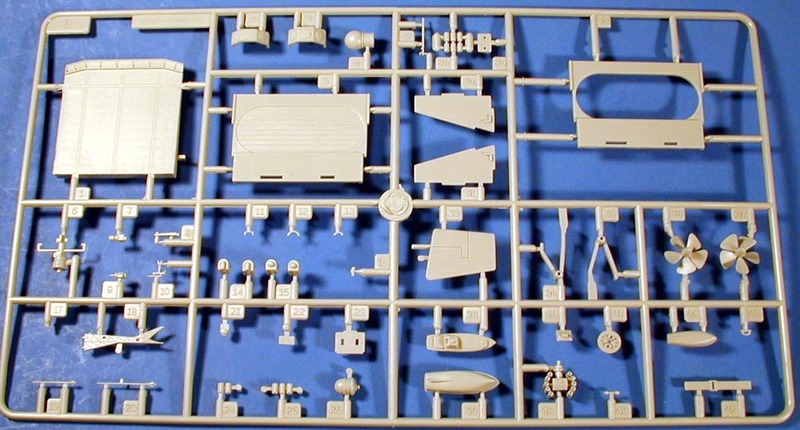 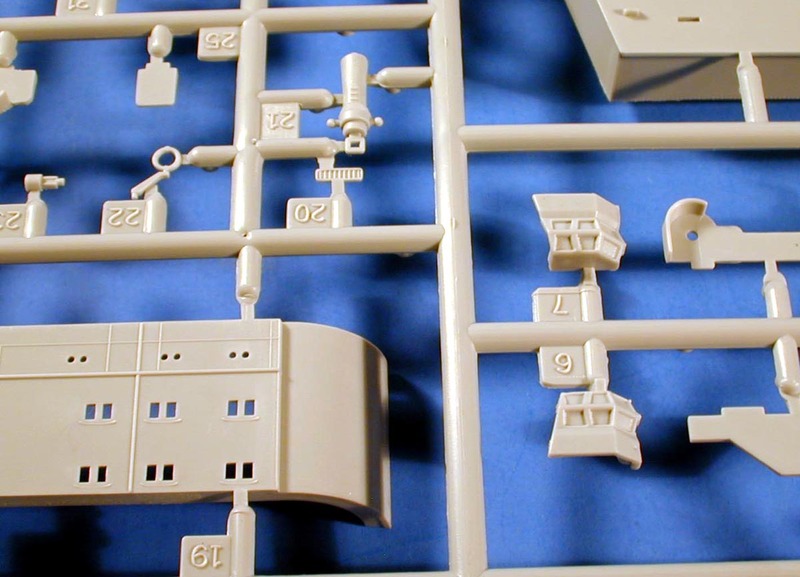 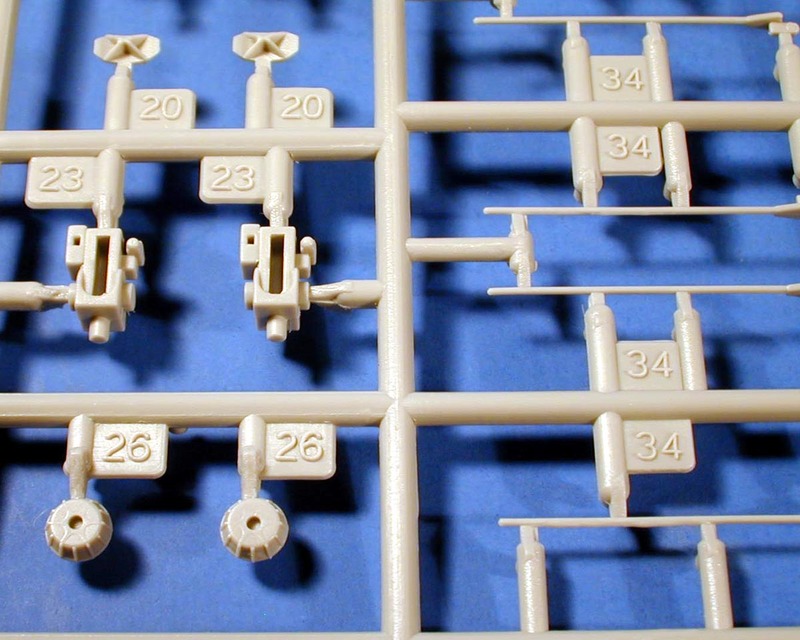 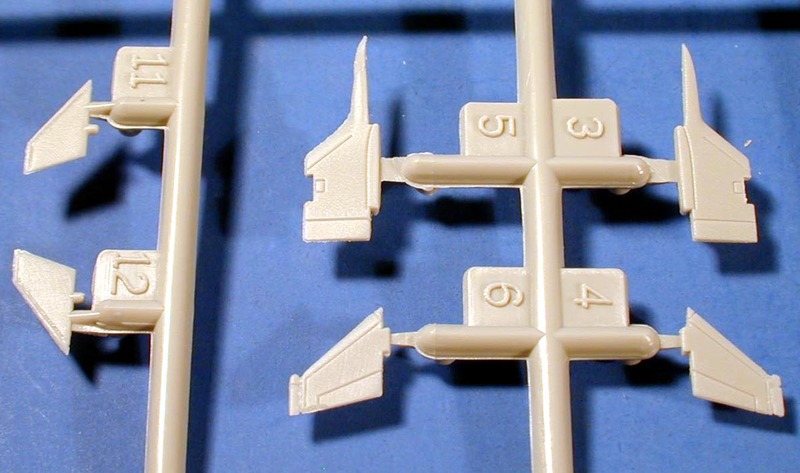 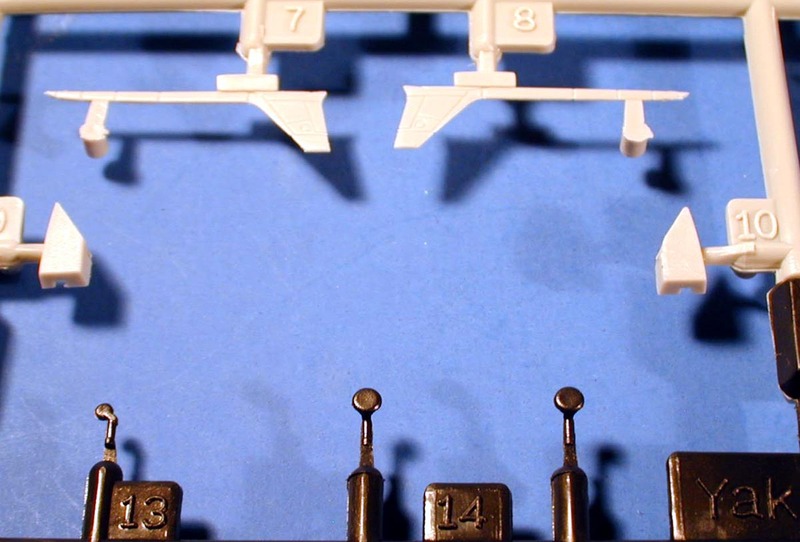 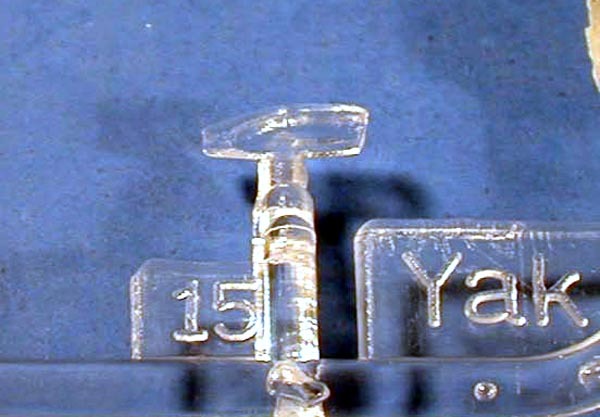 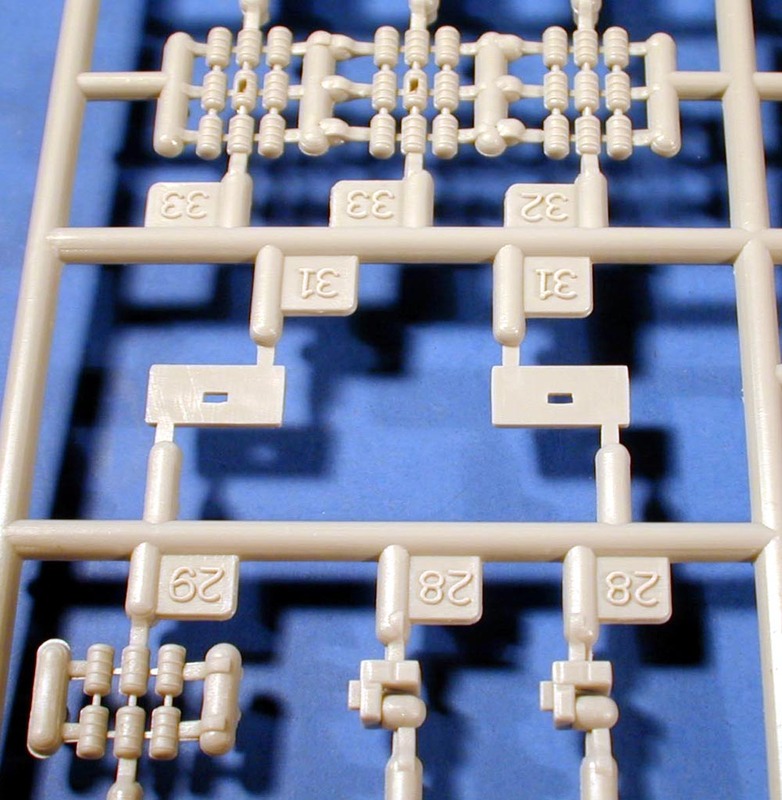 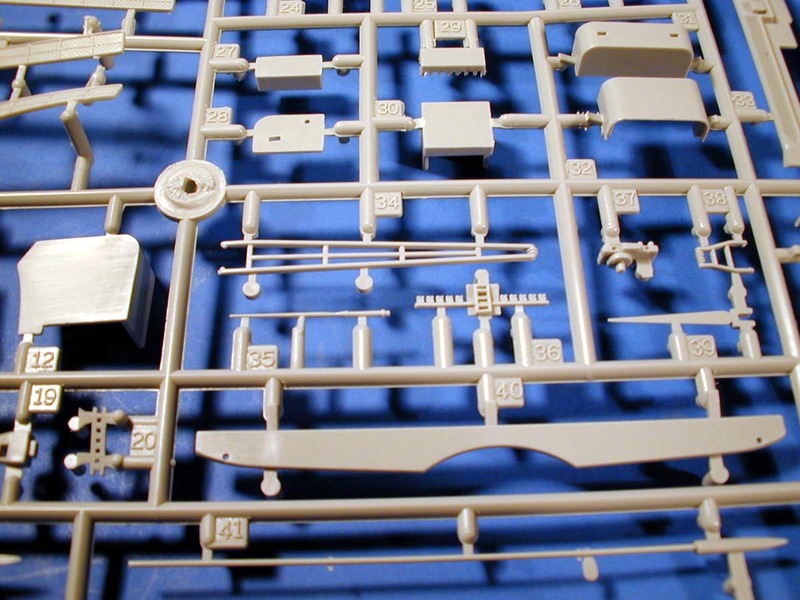 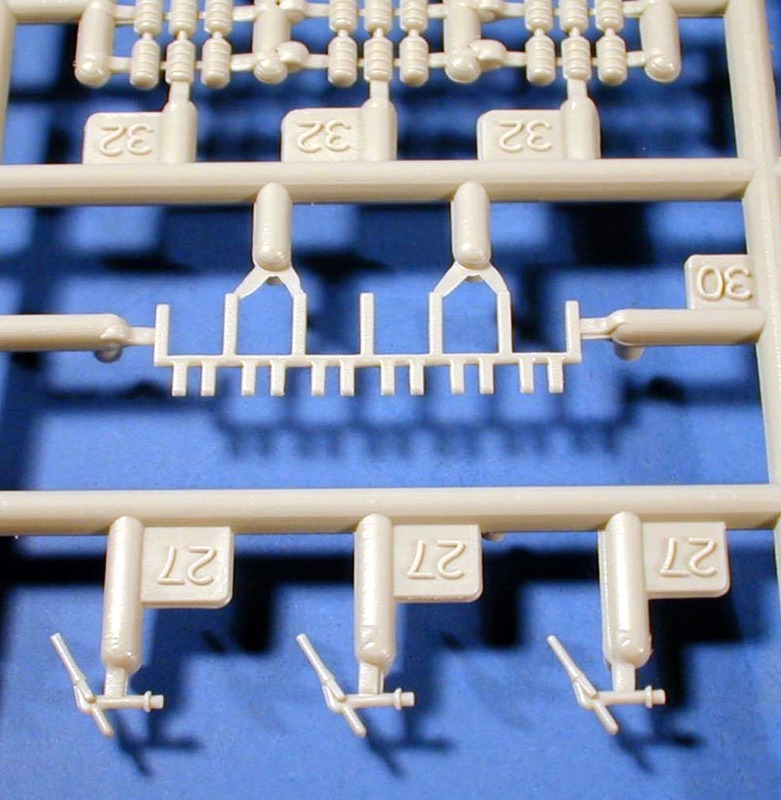 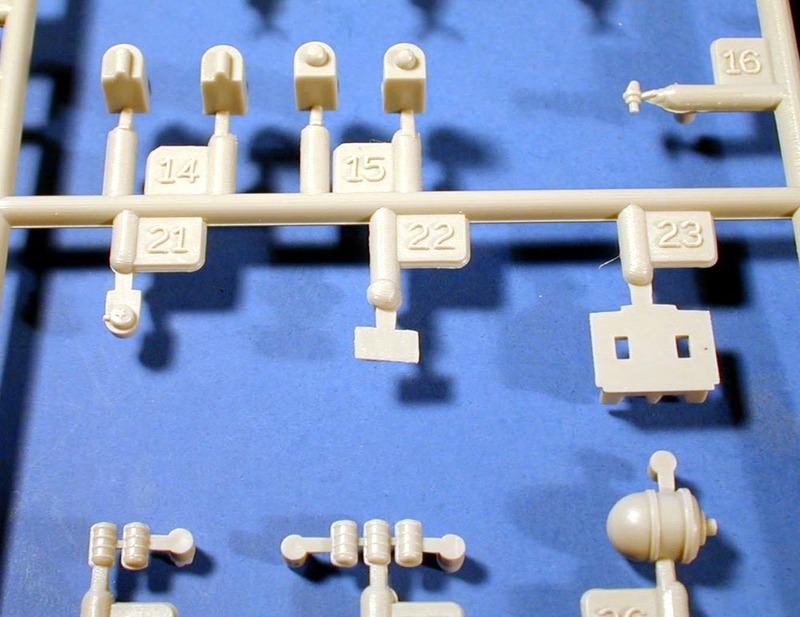 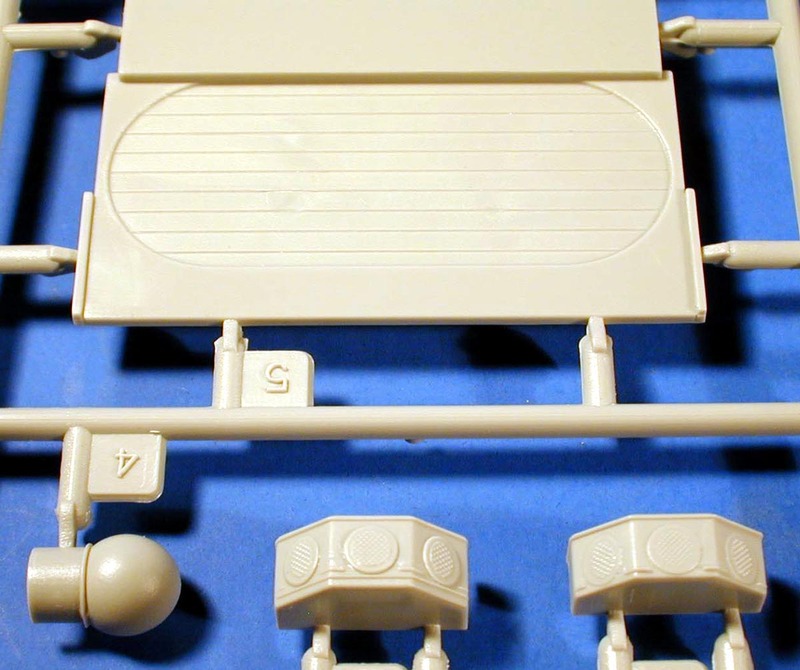 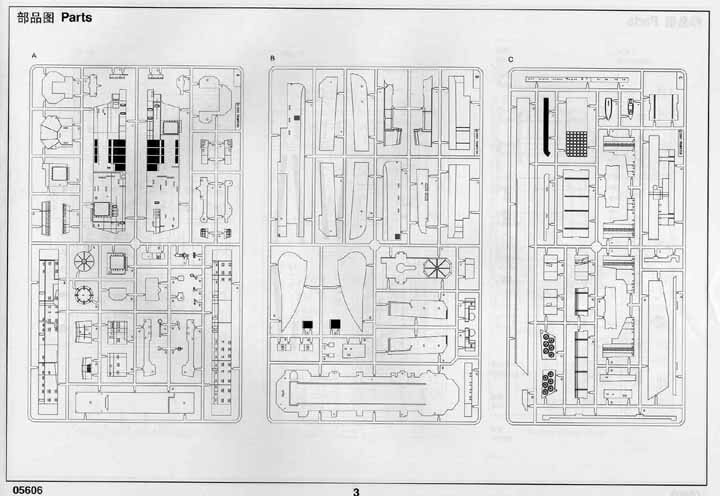 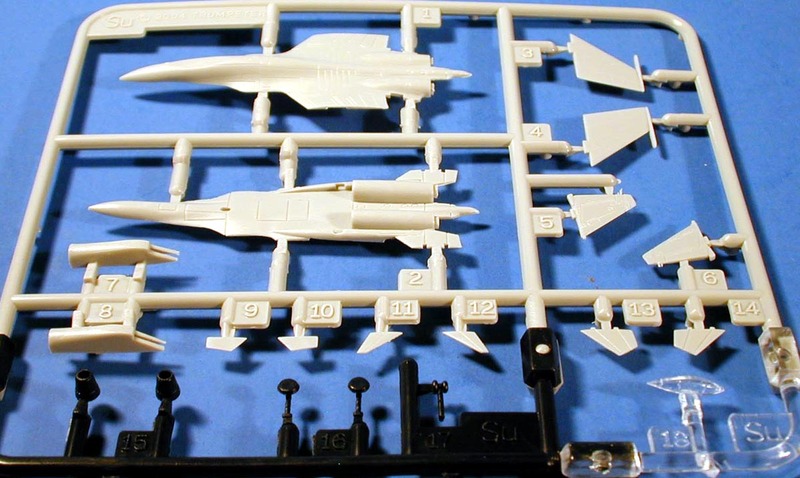 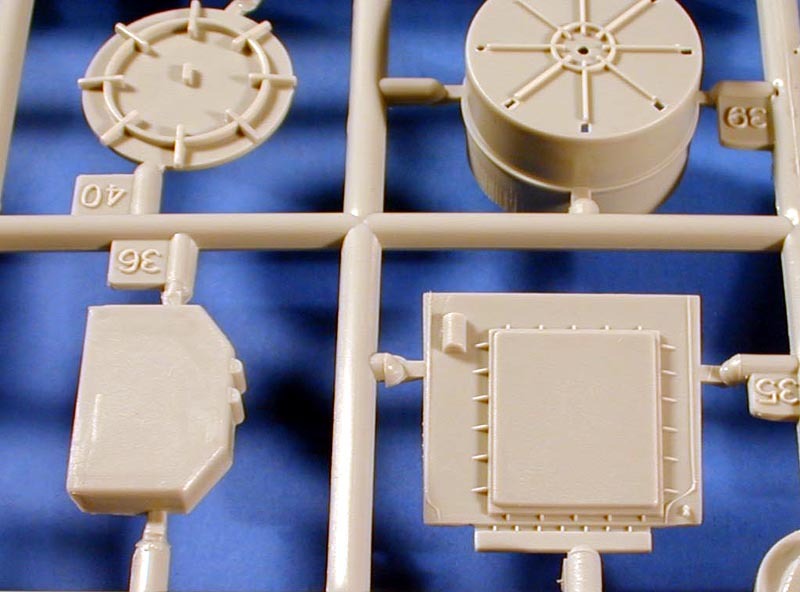 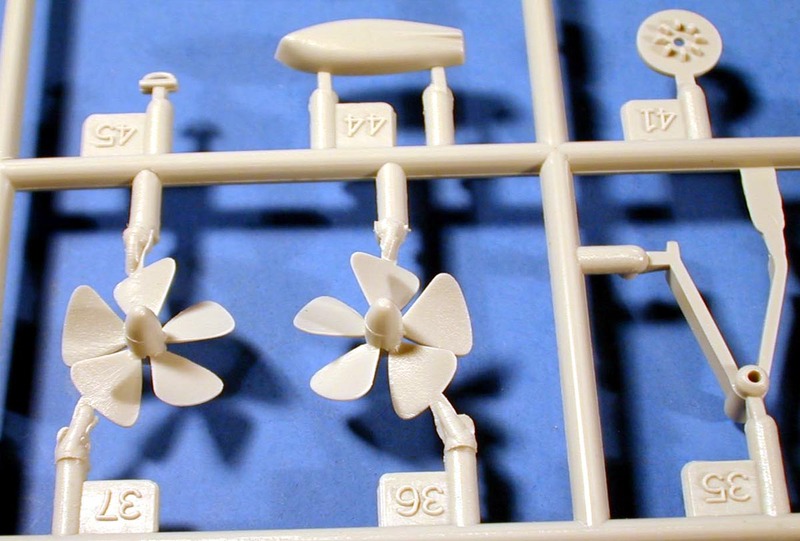 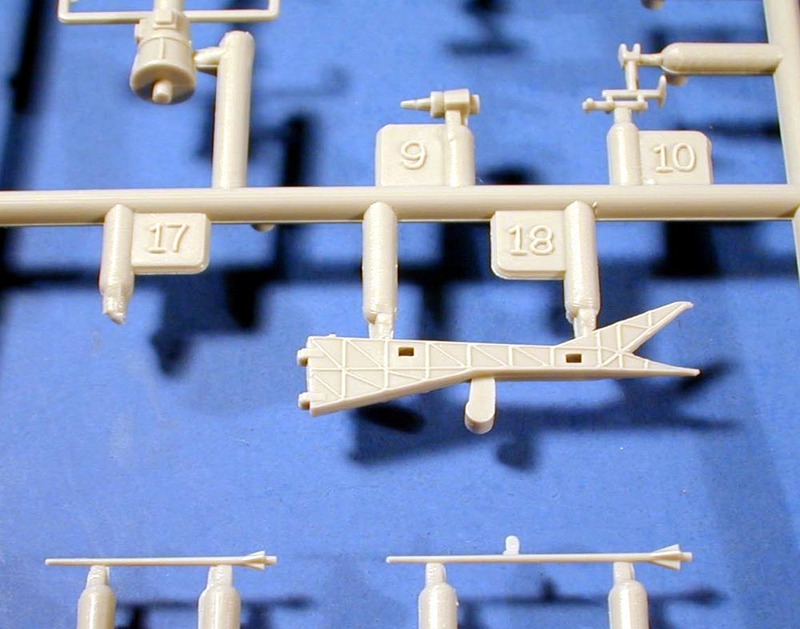 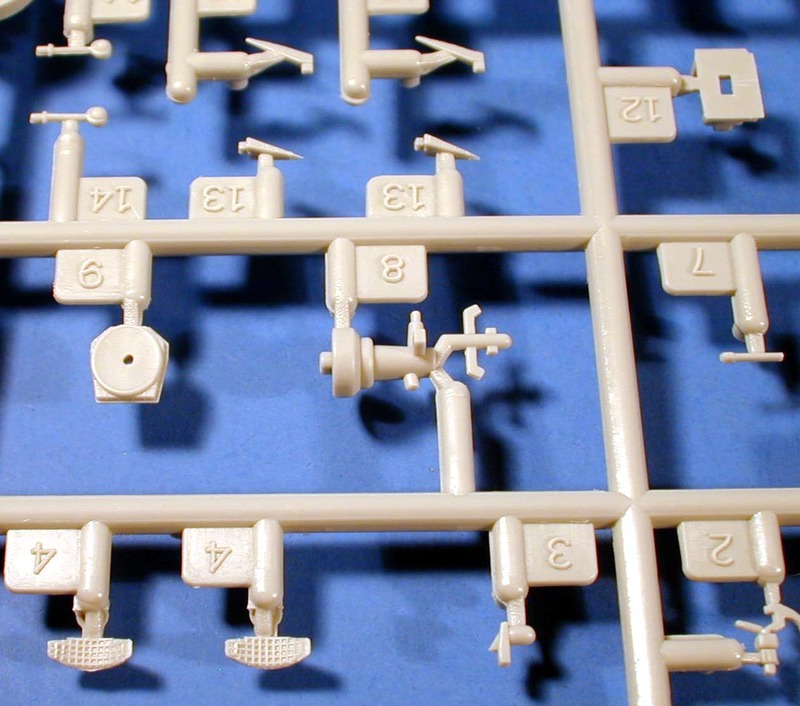 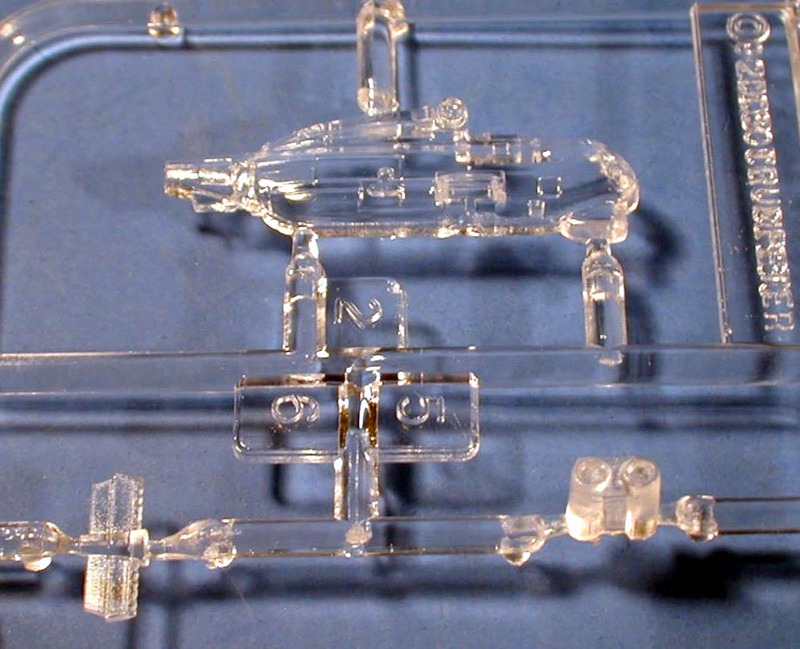 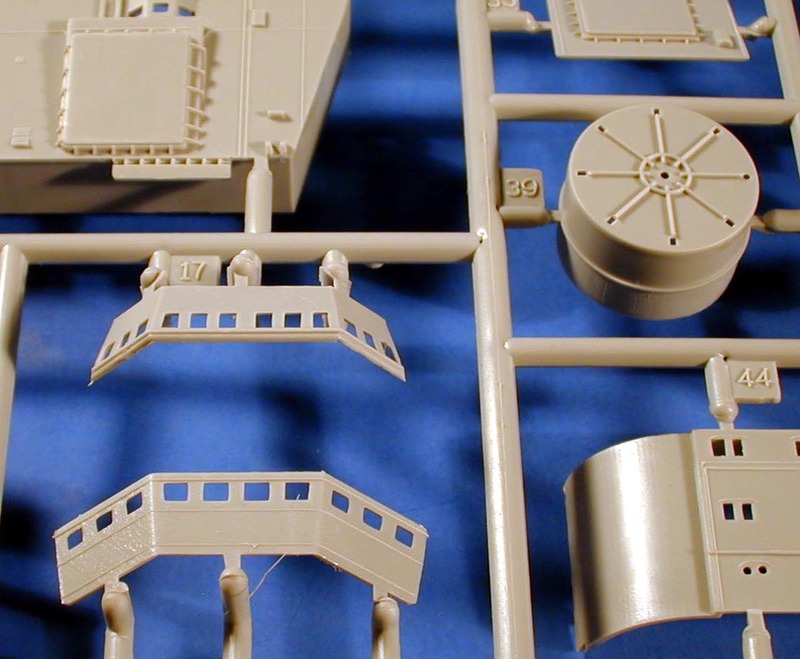 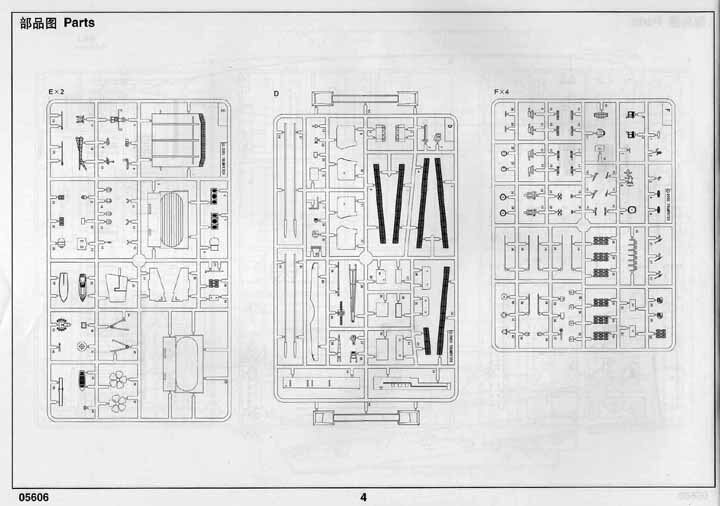 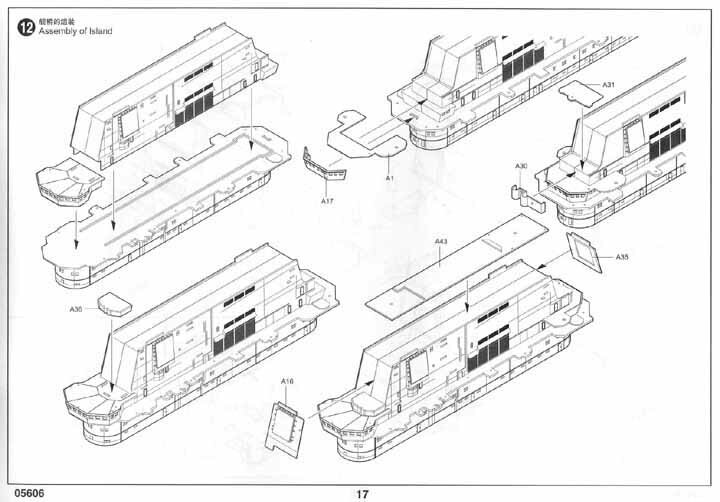 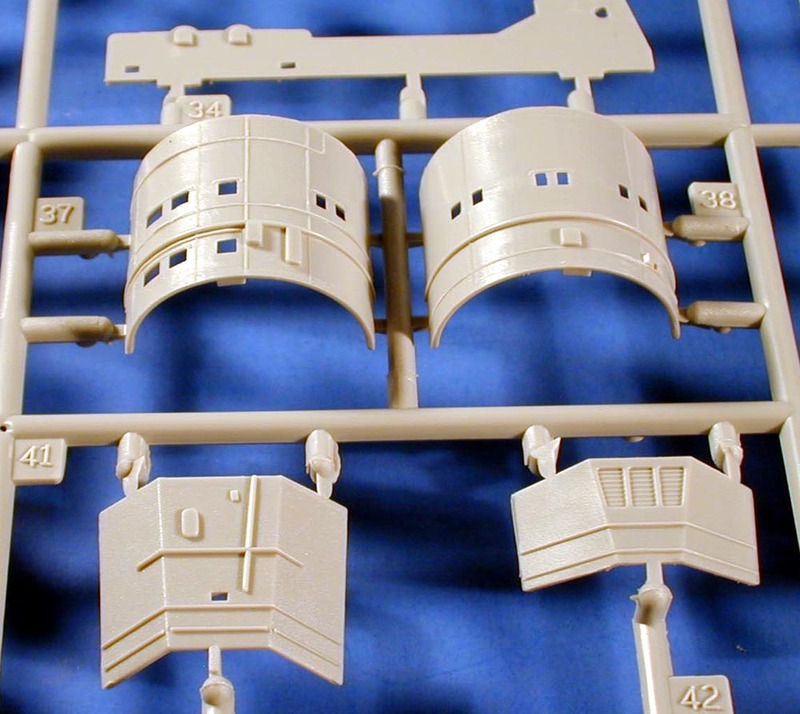 There are four of these sprue which include the majority of the weapons and radars. 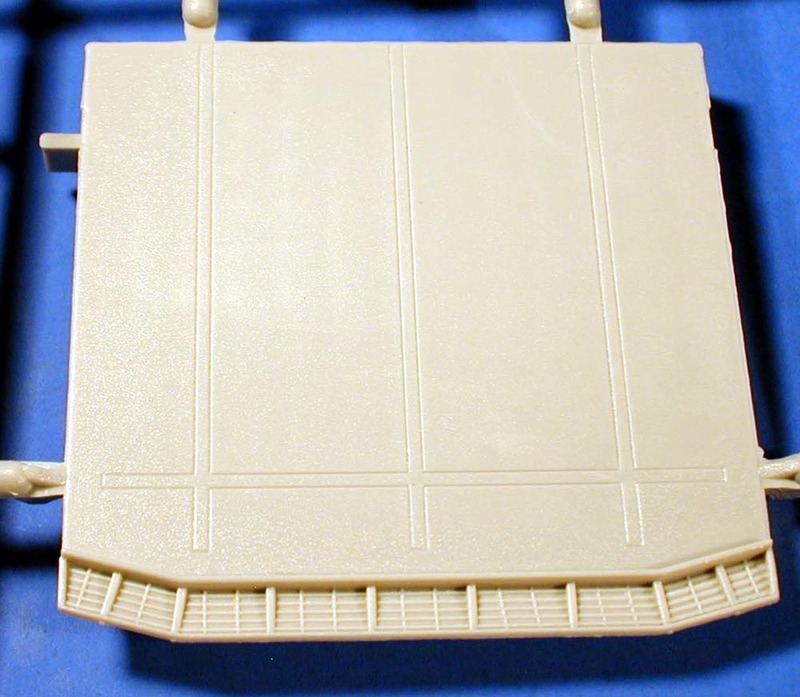 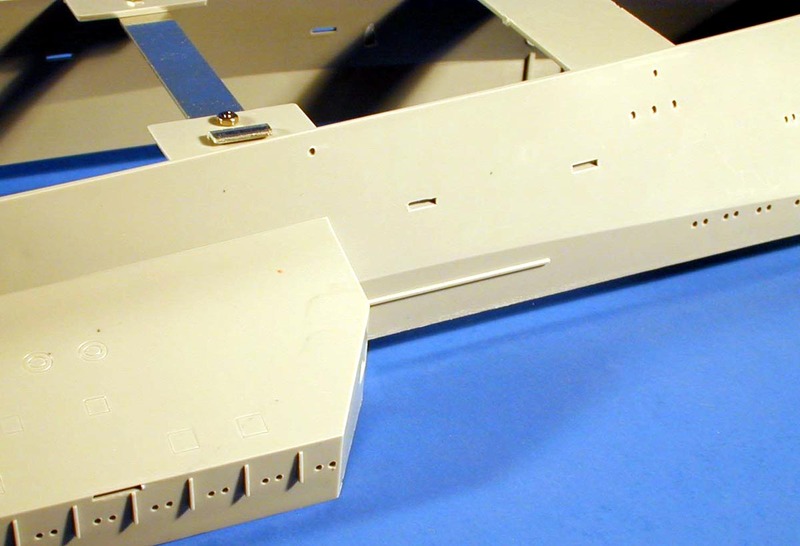 A black mounting base is included with nameplate for full hull display. 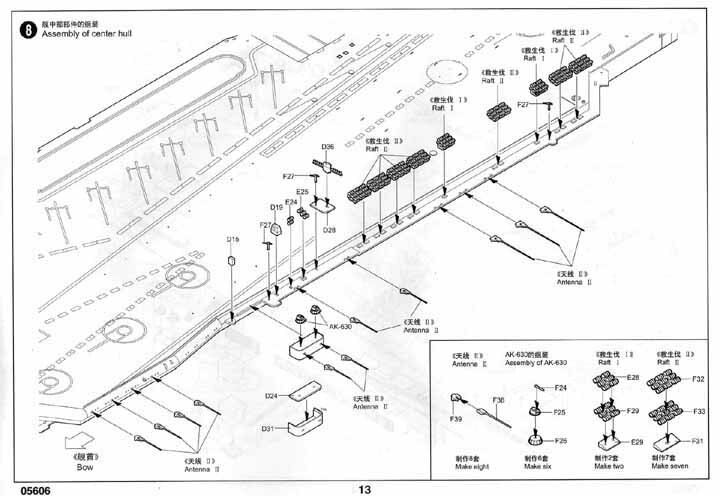 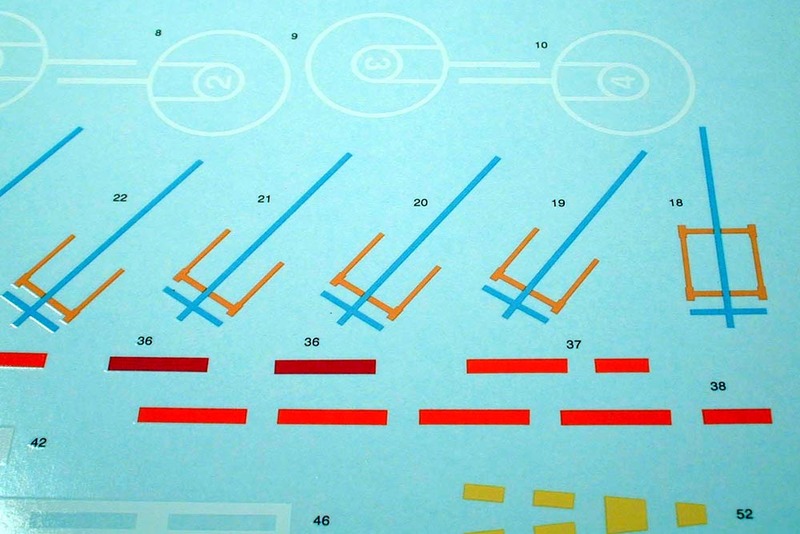 The decal sheet includes all of the deck markings for the aircraft parking areas and flight deck landing zones. 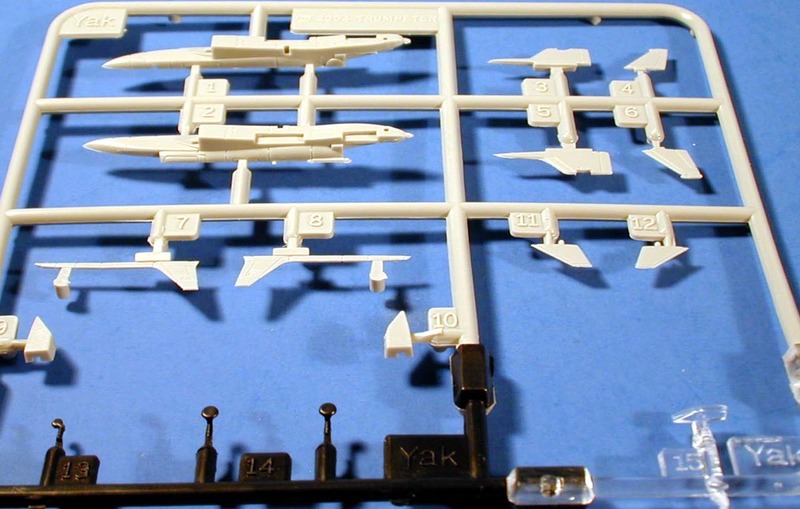 The decals are well registered and sharply rendered. 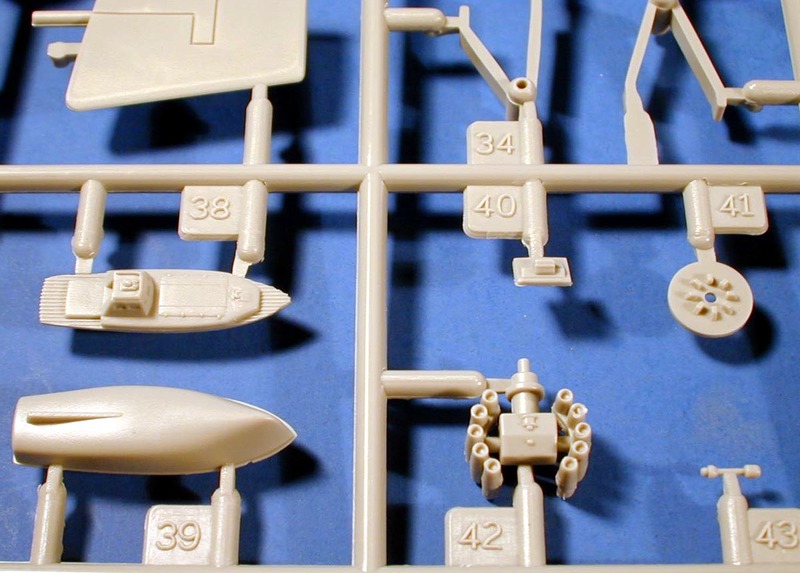 The aircraft in this kit are the best available in this scale. 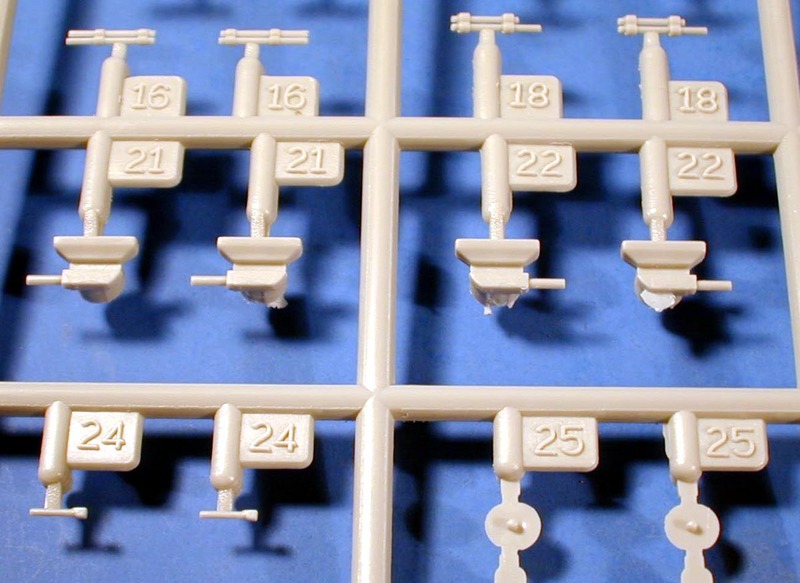 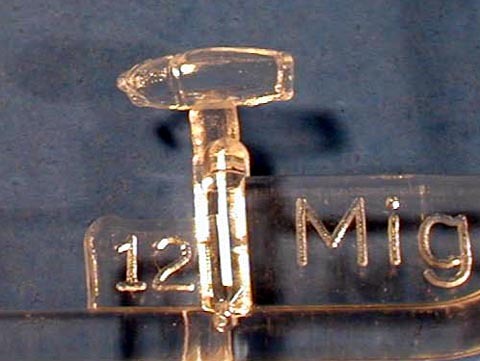 They are like little kits in themselves and are molded in gray, black and clear styrene. 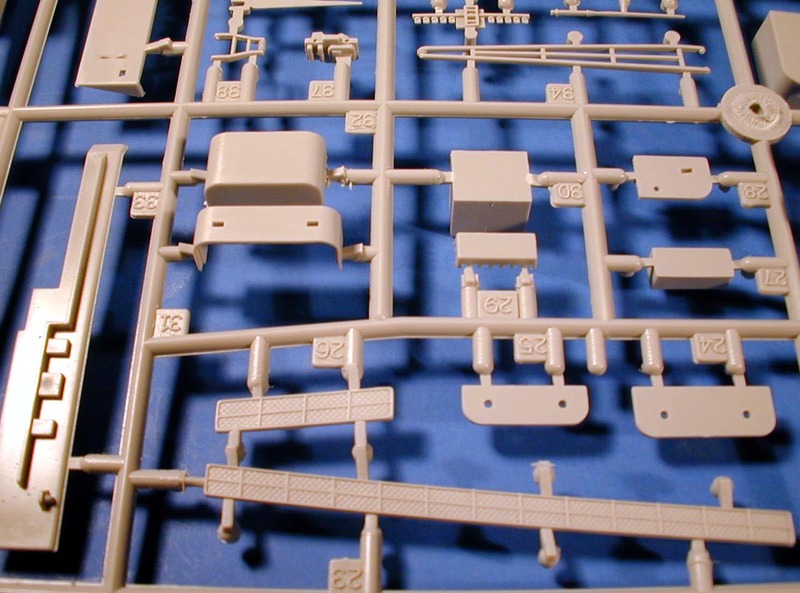 Many have details that are really fine for their size. 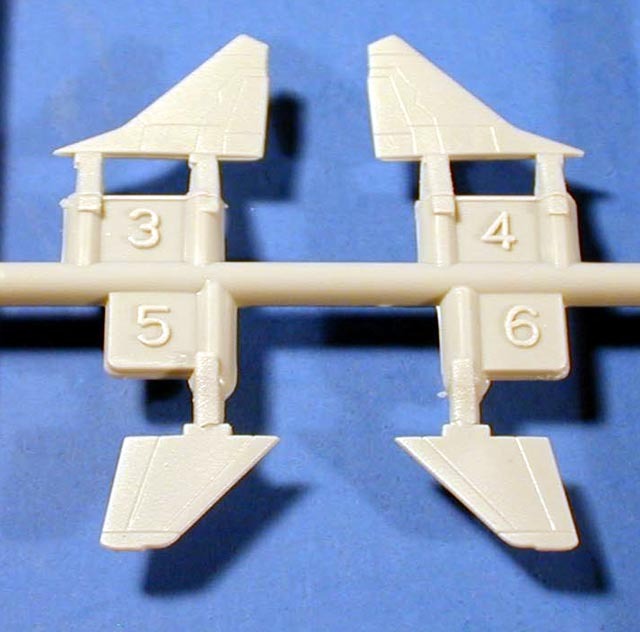 You can model the aircraft with folded wings or ready for launch. 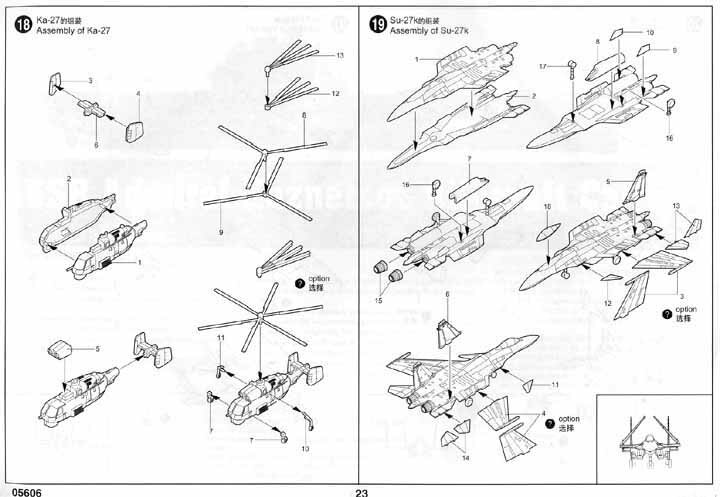 The Ka-27 includes folded rotor blades. 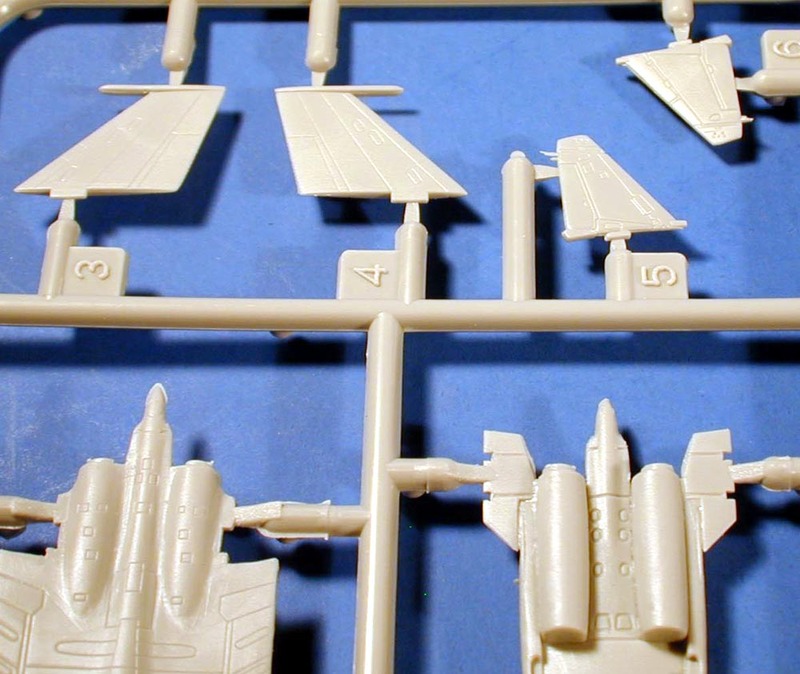 Su-27K Flanker D (six included). 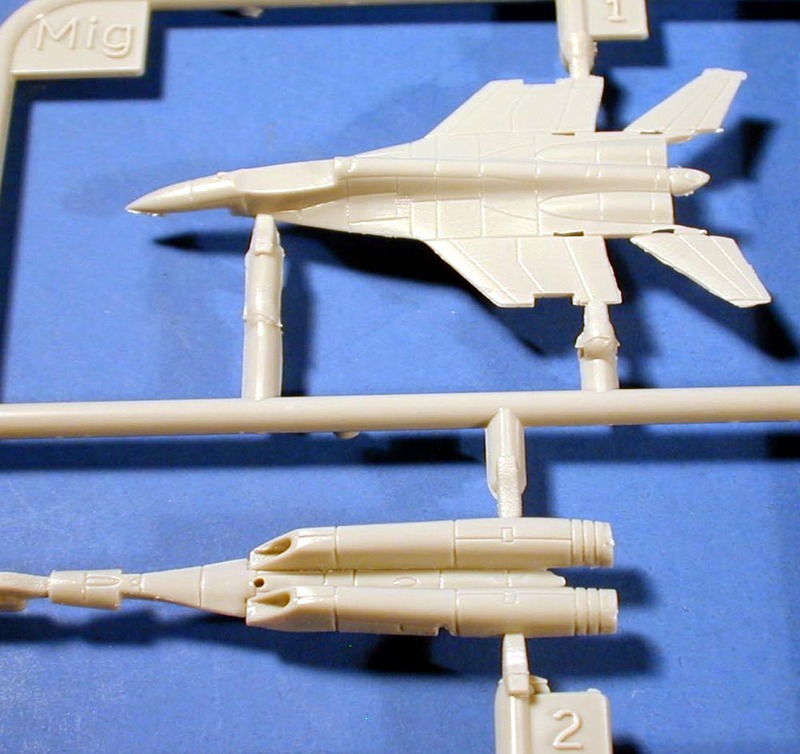 MiG-29K Fulcrum D (two included). 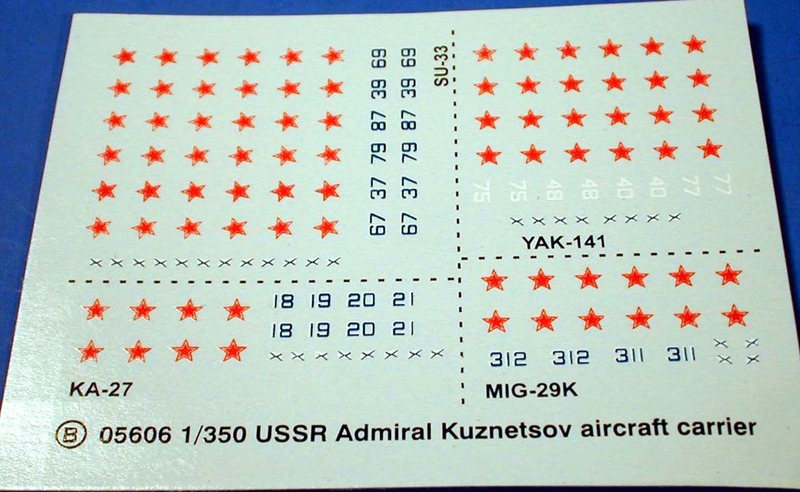 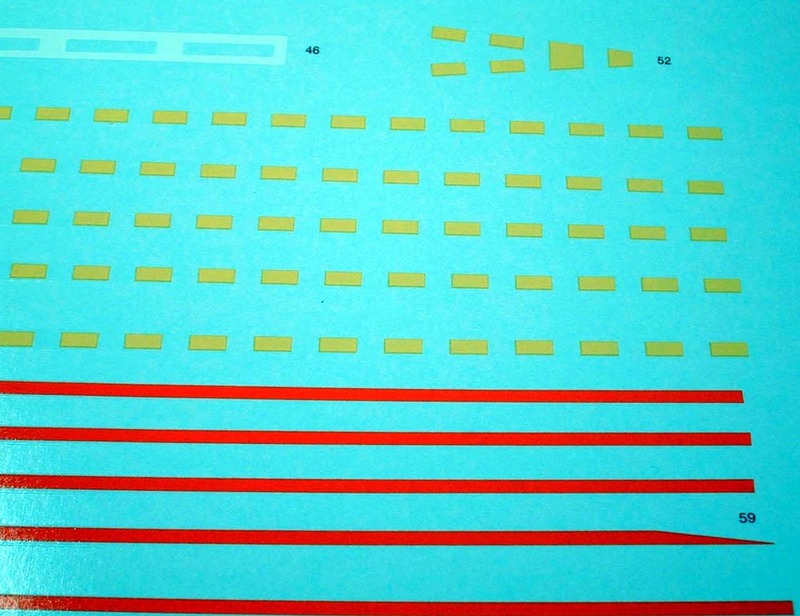 A decal sheet is included with markings for all of the above aircraft. 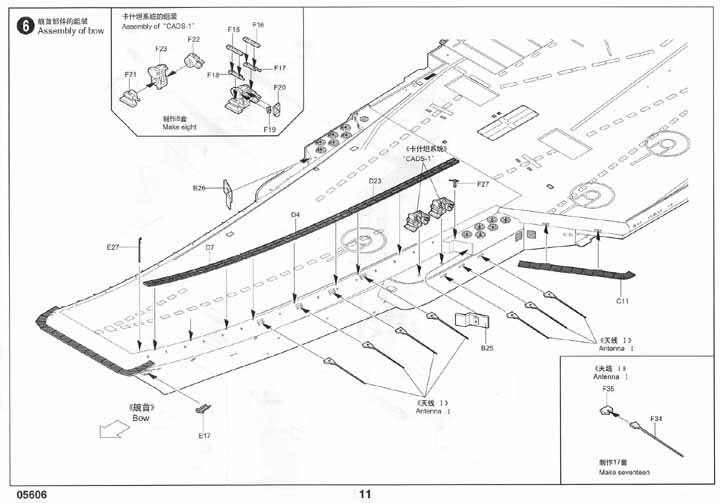 All of these aircraft are available separately as well. 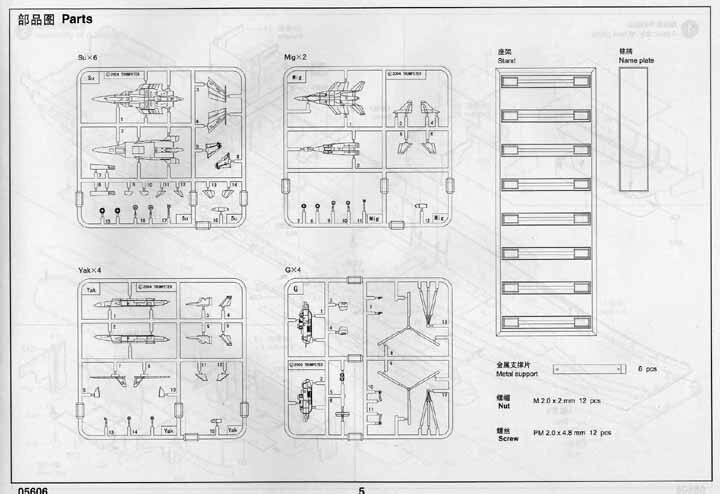 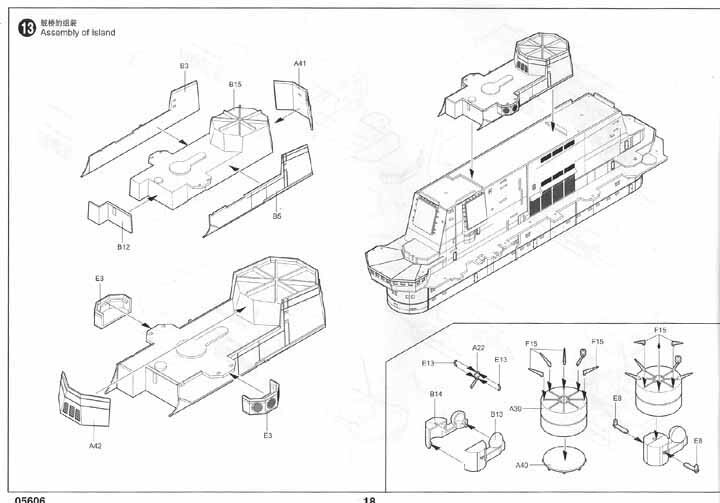 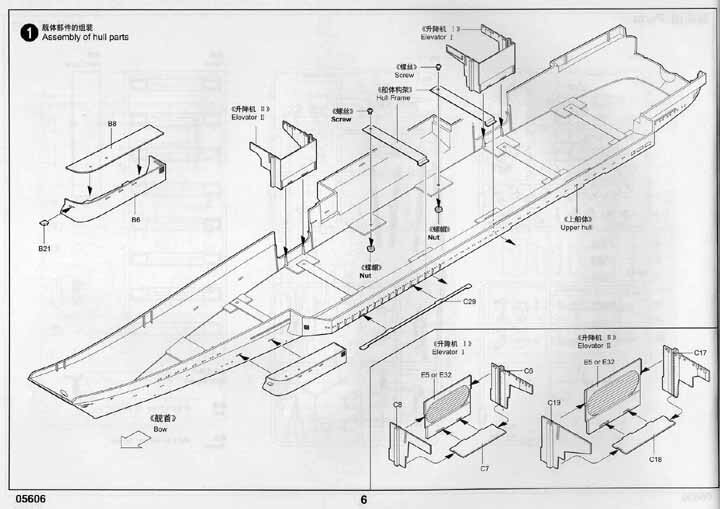 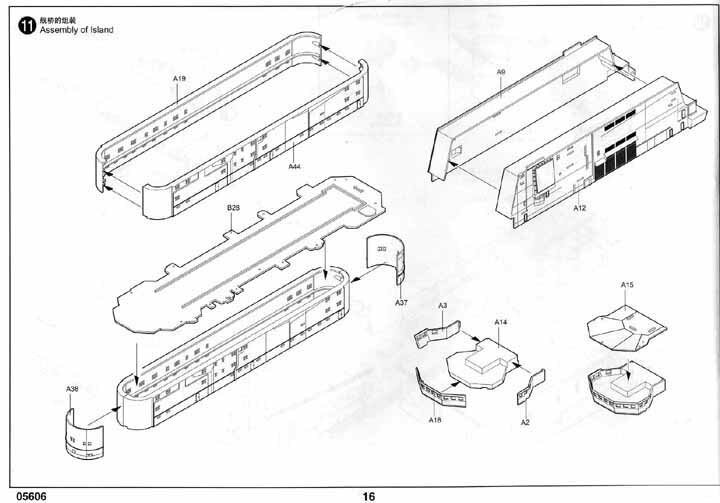 The instructions are a 24 page booklet showing the assembly in a step by step process that is easy to follow. 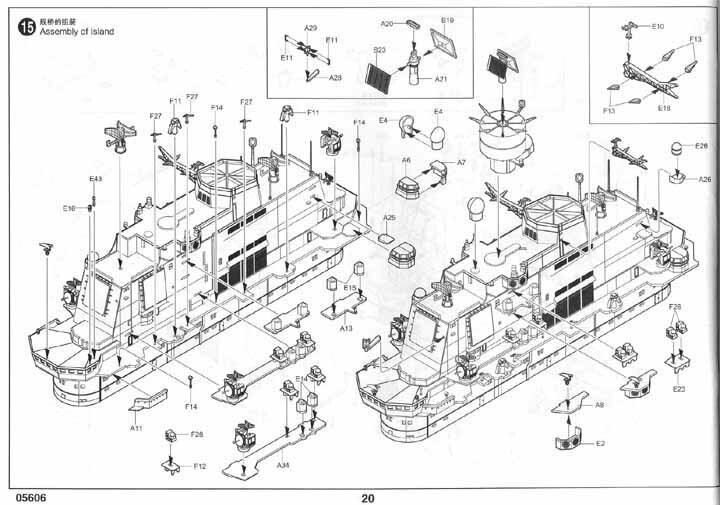 Very thorough and well illustrated. 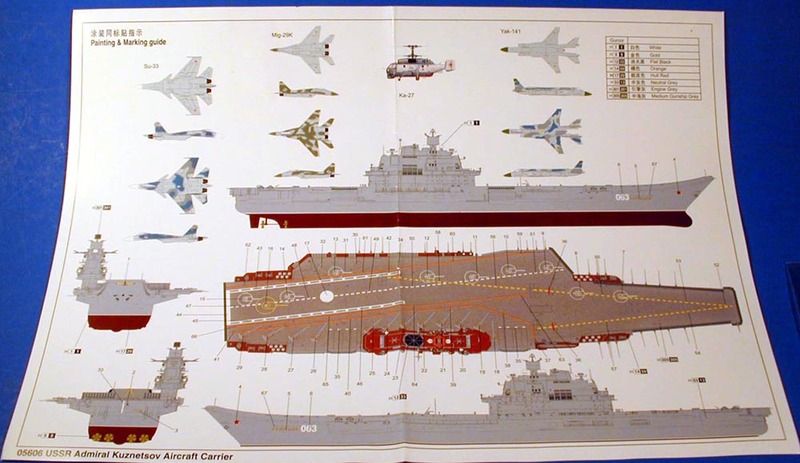 A full color B-size sheet has color painting and decal placement for both the ship and the aircraft. 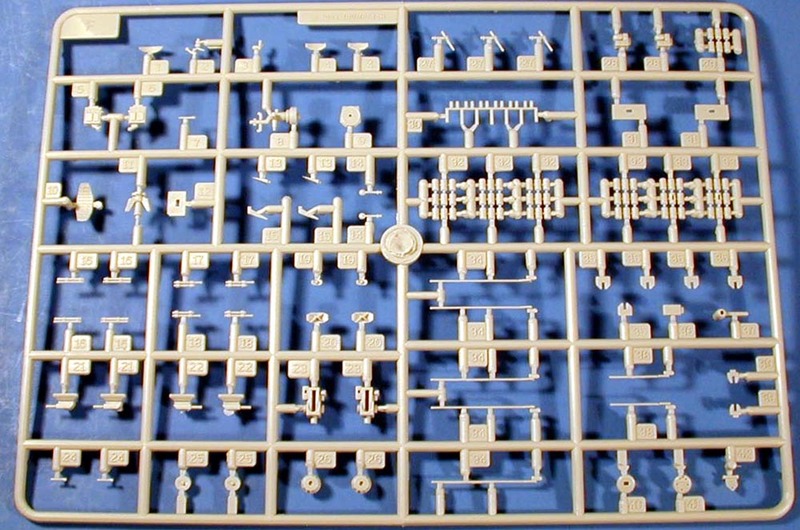 Another impressive kit from Trumpeter. 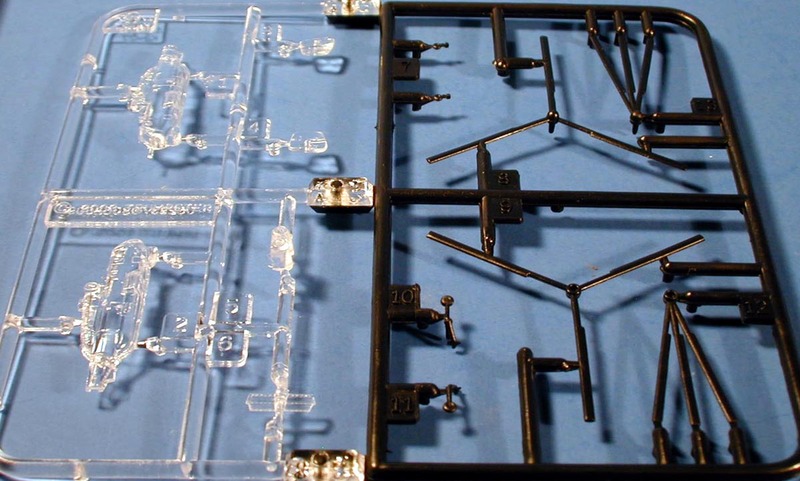 This kit retails for $199.00 (USD), but can be found on sale for less in most places.